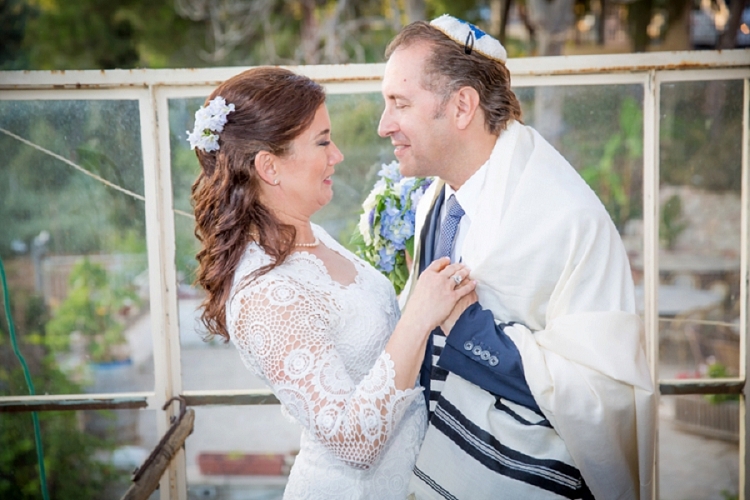 Today, I have a rare and precious gem of a real wedding to share; one that, in my eyes, truly embodies the essence of what it means to be Jewish. I hope that you are as moved and inspired by it as I am. This introduction is a little bit longer than I would usually write, but bear with me, because I really feel that this is a truly uplifting story that needs to be told and heard. It is an honour to be able to do so on this blog. 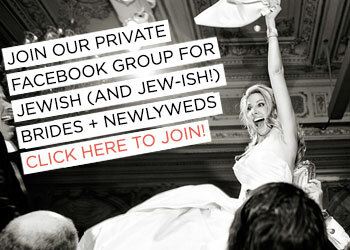 One of the most special things about Judaism is that it really does feel like being part of one big, eclectic family. This network of ours of Jewish souls connected by our shared history, by the familiar melodies that live in our hearts, by the wounds of our ancestors and the never-give-up spirit of our community, creates a unique bond, inexplicable in words, but demonstrable in actions. We may squabble and disagree, we may exasperate one another and we may have a million different ideas about how to practice our faith (or not), but when it comes down to it, when we really need each other, we are there. Being half Israeli, I have felt a lifelong bond with Israel and so much gratitude and affection for the young soldiers serving on my behalf. While the IDF has a system of compulsory military service for young men and women, there are also those that volunteer from overseas when they have no obligation to do so. Many of these are Israel’s Lone Soldiers. Sometimes orphaned, from broken homes, new immigrants or travelling solo of their own volition, these soldiers often have no family or close-knit support base in Israel. The experience, while admirable, can be a lonely one. With that in mind, their role in this story is particularly poignant. 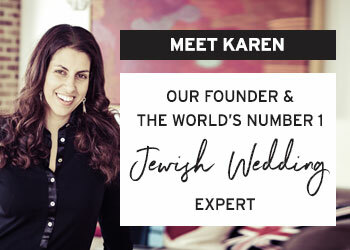 Margot and Glen, felt such a deep emotional connection to Israel that, rather than opting to wed in their home city of New York, they chose to be married in the old city of Jerusalem. 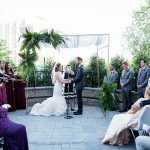 It was a second wedding for the pair, and a variety of logistical and emotional reasons saw them choosing to elope and not to fly in their respective children, parents, siblings and extended families. 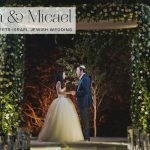 On arriving in Jerusalem, the couple faced a hurdle when they realised that they might not be able to assemble a ‘Minyan’ (a group of ten men over the age of 13 required for traditional Jewish worship and ceremonies) for the Seven Blessings under the chuppah. With no contacts or family nearby, how would they bring so many strangers together? 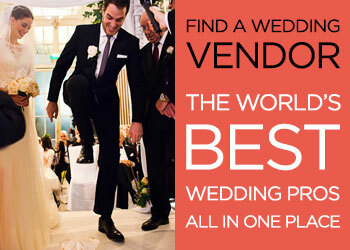 Fortunately, their wedding planner, Adena, had the perfect solution. Why not invite Lone Soldiers to be their guests and to participate in the ceremony? It would certainly be meaningful, memorable and would solve their logistical issue, while creating a special experience for the soldiers too. 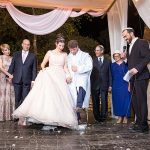 Margot and Glenn loved the idea, and so Adina took to Facebook with an urgent plea explaining that the US couple had no Minyan, nor family or friends to dance at their wedding and were inviting soldiers to join as their guests. The response was overwhelming. Dozens of replies poured in within minutes. 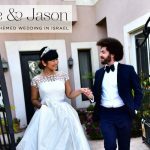 Within just four hours of the Facebook post going live, around 18 soldiers arrived on time (anyone who has been to Israel will know this is a miracle in itself) to the wedding. Almost every branch of the IDF was represented, including Artillery, Paratroopers, Tanks, Sniper, Intelligence and more. The soldiers came from a diverse range of backgrounds and ethnicities including Israeli, Ethiopian, American, Moroccan and Belgian, observant, non-observant, ultra-observant, traditional Jewish. 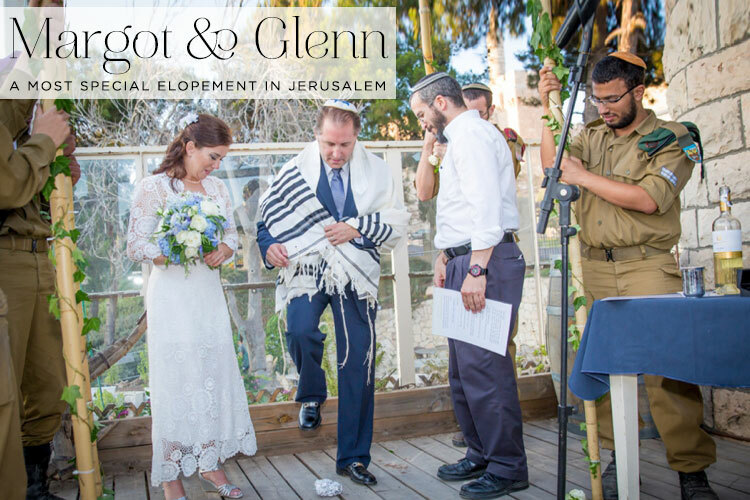 United by their shared Jewishness, by the mutual need for family at this special celebration, they held the four poles of the chuppah, made the Seven Blessings, sang, and clapped and danced, they lifted the groom on their shoulders and raised the bride on her chair. 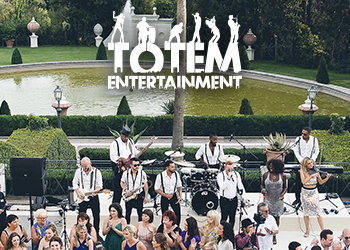 They ensured the merriment continued for the entire evening, fostering an atmosphere of happiness, celebration and high spirits at the wedding. By all accounts, their actions brought tears to the eyes of everybody who was there to witness it. 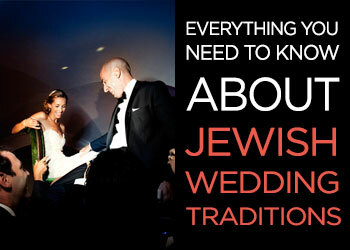 Although this wedding is tiny in guest numbers, intimate in atmosphere and modest in decor, it is truly one of the most emotionally meaningful real Jewish weddings I have ever blogged and I know that Margot and Glenn returned to their families in New York with stories, photos (by the incomparable, and much loved Smashing Supplier Herschel Gutman), memories and feelings of a most memorable unparalleled event. Margot, the bride: The “official” story is that we met through work. The rest is more clandestine, and we’ll never tell! 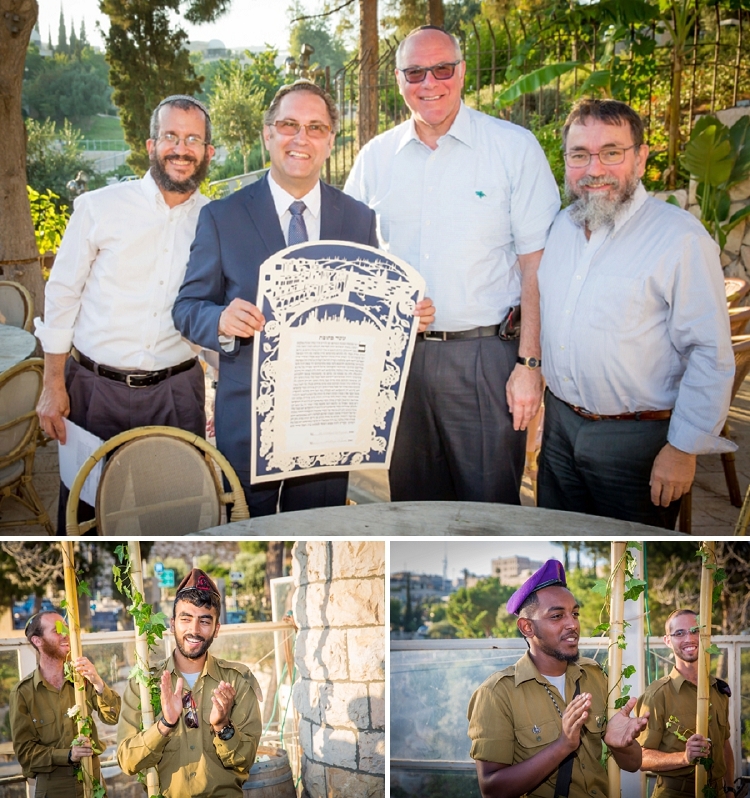 We got married at The Eucalyptus, an exquisite restaurant in Jerusalem. We loved the space, and feel a special connection to Jerusalem, a city rich in history, architecture, archeology and spirit. 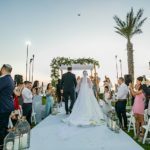 The ceremony and dinner took place on the restaurant rooftop terrace which overlooks the Old City walls on one side, and the skyline of the New City of Jerusalem, including the fountains at Teddy Park on the other. Roshelle Make-Up & Hair Artist was wonderful to work with. I wore a blue hydrangea in my hair, and nothing else except a ton of hairspray to keep my Jewish hair under control. I bought my dress online (I’m sorry I can’t remember where from!). I fell in love with the lace. I love shoes. My sister calls me Imelda Margot (like Imelda Marcos, the widow of the Philippine dictator, who reportedly had thousands of pairs of shoes.) I ordered nine pairs of shoes from Nordstrom and had a neighbour consult on what looked best with my dress. Once I picked the “ones” I took eight pairs back to Nordstrom. I thought they might ban me for life! Glenn wore a lovely blue suit — again, we eloped, so we didn’t fuss. My deceased father always said to focus on the marriage, not the wedding. That’s what we decided to do. Glenn also wore a kippah that his grandmother crocheted for his bar mitzvah in 1978! She made them for the entire family, and it made her more present 30+ years later. We ordered a beautiful Ketubah from Papercuts by Oren, an artist in Tel Aviv. He integrated a scene from Jerusalem, where we were married, and New York, where we met plus five little doves to signify our five children. Our chuppah was my father and grandfather’s two tallits sewn together, which felt so very meaningful. The night before the wedding, I was sitting with Adena, our wedding planner, and I just blurted out that I felt like my father would somehow show up. He died in 2012, but he felt very present. The following day, as we entered the restaurant for our wedding ceremony, another couple walked in and I couldn’t believe it, but the man was the longtime friend and attorney of my father! 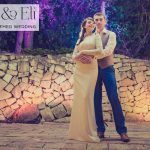 He happened to arrive at the restaurant at that exact time, not knowing that we were getting married or even that I was in Israel. Herschel Gutman captured the day. He was outstanding from start to finish. Elope! Especially for a second time bride or groom. Having no family and friends made it so much easier. We did tell our kids and parents in order to get their “sign off” (!) and everyone was just fine with this. There were so many decisions we didn’t have to make, so we could really focus on starting our life together.